UC Irvine students and alumni gathered on campus to watch and cheer as the Anteaters took on Oregon in the NCAA basketball tournament. 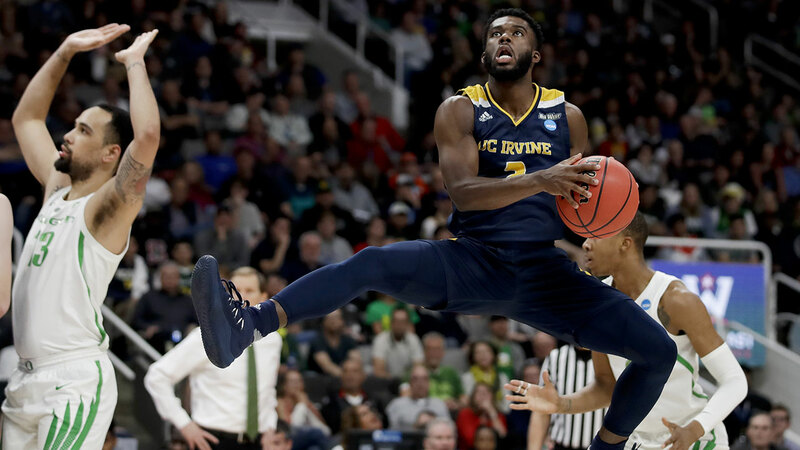 SAN JOSE, Calif. -- UC Irvine's hopes to be the Cinderella of the NCAA tournament ended Sunday in a disappointing 73-54 loss to Oregon. The No. 13 seed Anteaters had already showed some underdog potential when they upset No 4. Kansas State 70-64 last week in the first round of the March Madness tourney. But the No. 12 Ducks proved too much for Irvine. Ehab Amin sparked Oregon out of a long drought to start the second half and the Ducks became the lone double-digit seed to advance to the Sweet 16. UC Irvine guard Max Hazzard jumps during a game against Oregon in the NCAA basketball tournament on Sunday, March 24, 2019 in San Jose.